In 2014, Kaplan provided interior and exterior renovations to BPSI’s Colby Hall, a 12,540 SF building listed on the National Register of Historic Places. Built in 1866, Colby Hall is a Romanesque Revival, Second Empire stone masonry building with wood framed floors, roof, and stud partitions. 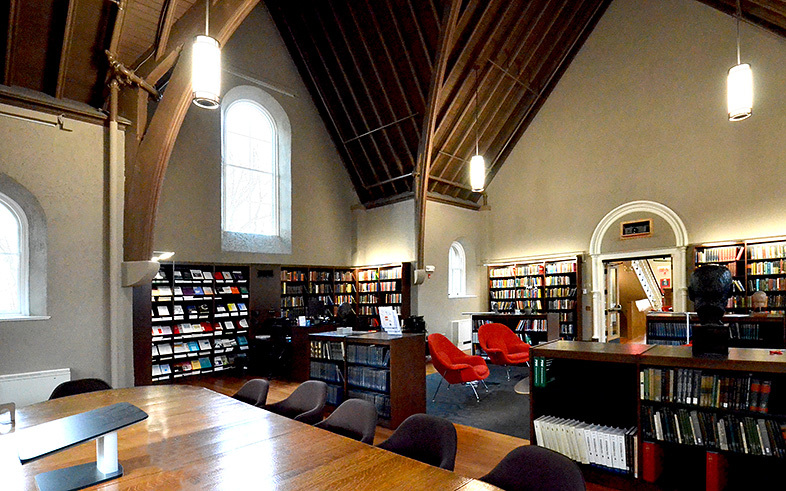 Kaplan renovated and reconfigured the building’s three floors to accommodate BPSI’s program spaces and converted the attached vaulted chapel to a library and multi-purpose room to host lectures, dinners, and functions. Off the entrance is a casually furnished Community Room with an attached kitchenette that is being used as communal gathering space for students, members and faculty. Colby Hall now supports more than 500 members and 150 volunteer faculty, providing space for seminars, the largest psychoanalytical library and archives in the country, and educational programs for members, students and the public. In 2015, Kaplan was honored with three Associated Builders and Contractors Massachusetts’ Excellence in Construction awards: the Merit award for historical restoration over $1MM, the Green award, and the Safety award. The BPSI community is thrilled with the renovated space. Schwartz Silver Architects and Kaplan Construction helped us to transform a once elegant but tired mid-19th century stone building into an open, stylish building with flexible and generous spaces in which to exchange ideas in formal and informal settings. On the first day of classes in the new building, the Community Room was filled with people sitting at the café tables and on the couches, or just milling about and talking. The library, with moveable bookcases and chairs in place, looks at once elegant and inviting. Both our candidates and faculty are full of wonder at how beautifully the project has come together.